NKM designs and manufacture the RBM series Ribbon Blender to meet the demand of efficient and versatile blending of dry powders, granules and viscous paste materials. 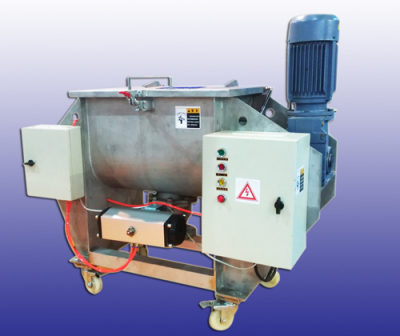 The Ribbon Mixer is different from the Ploughshare Mixer with the innovative ribbon shaped agitator inside of a U shaped container, although both are versatile mixing machines for universal blending of different types of materials. 1) NKM designs our Ribbon Blender which is able to achieve a maximum mixture ratio of 1:500,000, which means you can get the desired mixture proportion of components in as small as 1 gram with a batch of 500kg. 2) NKM is able to design the Ribbon Blender to be used as a reactor, dryer or deaerator, with the additional heating jacket, vacuum system, etc. 3) Different ribbon types are available for various applications: standard ribbon agitator for center discharge, interrupted ribbon for high density materials, and continuous ribbon agitator for end discharge (for continuous operation). 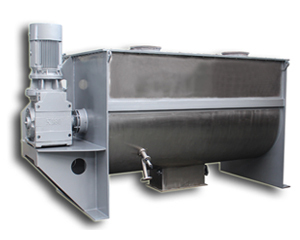 6) Discharge height of the Ribbon Blender can be specified according to customer’s request. 7) Optional ‘bomb-bay discharge door’ can be used to discharge the finished product fast and completely, and minimize segregation during the discharge cycle. 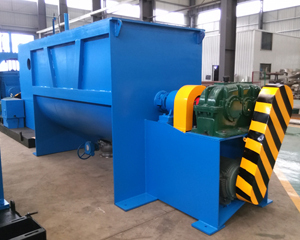 The basic RBM series Ribbon Mixer is comprised of a U-shaped trough, a horizontally mounted shaft with double-ribbon agitators, the trough cover for feeding (loading hopper is an option), a bottom valve for discharging, complete driving system and support frameworks. 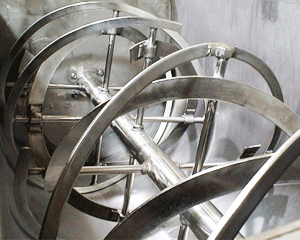 During the mixing operation of the Ribbon Blender, materials are moved in a way that a part of them from center to the ends of container, while simultaneously the other part from end walls to the center; besides, materials are also lifted by the double-ribbon agitators and then drops by gravity. With such a three-dimensional motion, the total materials in the trough can be mixed efficiently within a short time. Due to its less aggressive mixing, Ribbon Blenders ask for relatively lower power consumption compared with Ploughshare Mixers.